Advances in DEA Theory and Applications provides a much-needed framework for assessing the performance of competing entities with special emphasis on forecasting models. It helps readers to determine the most appropriate methodology in order to make the most accurate decisions for implementation. 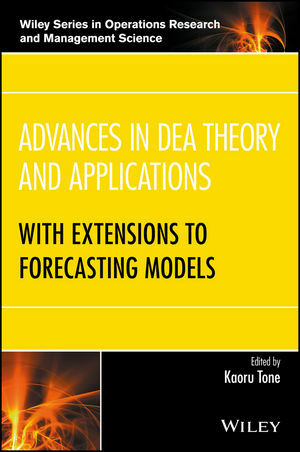 Written by a noted expert in the field, this text provides a review of the latest advances in DEA theory and applications to the field of forecasting. Advances in DEA Theory and Applications includes information on a balanced benchmarking tool that is designed to help organizations examine their assumptions about their productivity and performance. KAORU TONE is with the National Graduate Institute for Policy Studies, Japan. His contribution to DEA has a variety of attainments. He authored a classical book Data Envelopment Analysis: A Comprehensive Text with Models, Applications, References and DEA-Solver Software under the co-authorship with Professor Cooper (University of Texas) and Professor Seiford (University of Michigan). He also published many papers on DEA in international journals. Kaoru Tone opened a new avenue for performance evaluation, called Slacks-based Measure (SBM) that is widely utilized over the world. His recent innovations include Network SBM, Dynamic SBM, Dynamic DEA with Network Structure, Congestion, Returns-to-growth in DEA, Ownership-specified Network DEA, Non-convex Frontier DEA, Past-Present-Future Inter-temporal DEA, Resampling DEA and SBM-Max.